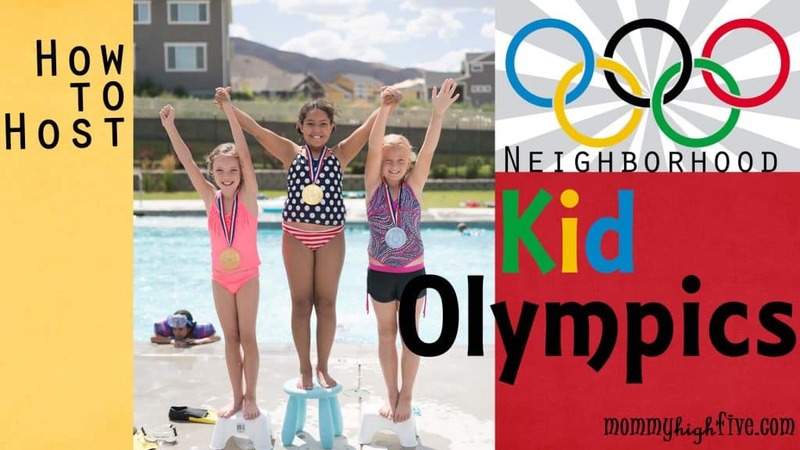 Hosting a neighborhood Olympics is a great way to get your kids excited about the Olympic games. 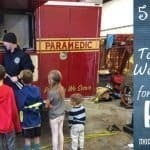 Here are some event ideas as well as a free invitation. I like the Olympics but it was a friend that ignited the fire in me. She spoke of the stories behind the athletes as well as how our country comes together as one. As Americans we let go of color, race, religion, and politics to cheer on our Olympians. It’s amazing to see Olympians around the world wave their country’s flag with pride regardless of whether they have a chance at victory or are simply representing their people. Inspirational commercials take over the airways. It’s that spirit that gets me. 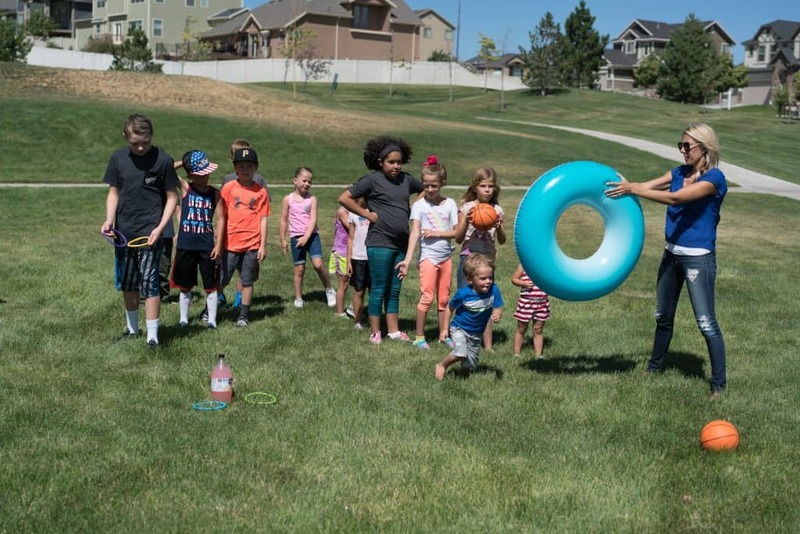 With this new found love for the Olympics, I decided to share the love with the kids in our neighborhood and have some fun getting them excited for the games by hosting a neighborhood kid Olympic games. For medals and Olympic decor I went to Zurchers, as they seem to have the best selection. I also got my amazing friend and neighbor to make a *super cute invitation. It can be seen at the right of this page. She owns a darling Etsy shop. I wanted one that looked like a VIP Access pass for all the kids. It turned out so cute. *For a free full-sized copy of the invite go to www.amysimpledesigns.com and send Amy a message. 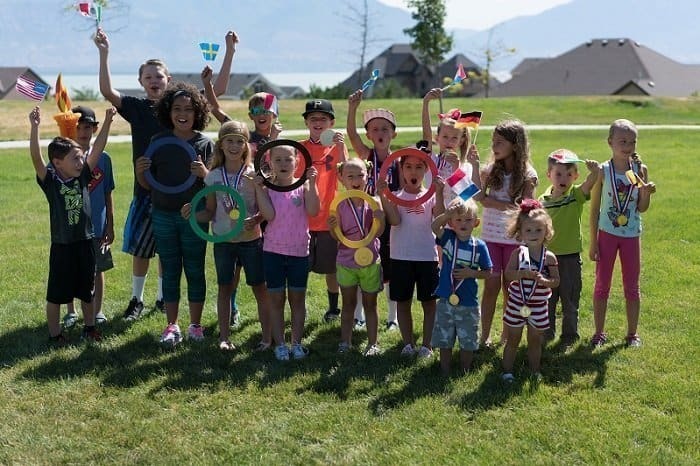 After supplies were purchased and invitations were sent out, we held our neighborhood Olympics. Hopefully some of these ideas will inspire you to host your own Olympics. Go Team USA! This is like a little Parade of Nations. Get all your neighbor kids together and march down the street. You can even make a torch and have the kids walk in a big group. Our kids loved this and all the parents loved watching it too. 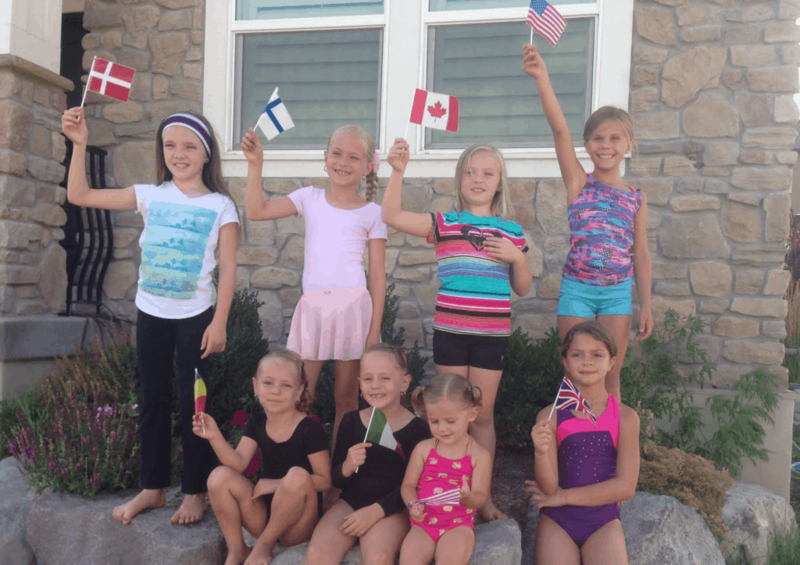 The kids held flags from all the different countries and they learned about what country they were representing. We then said, “Let the Games Begin” and all the kids jumped in the air. It was really cute. Parents loved taking pictures and the kids felt like little super stars. 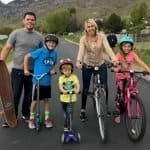 Have the kids get on their bikes, big wheels, scooters, mini cars, or whatever they have. We had a little bike race in our cul de sac. We had winners for the fastest and coolest bike. 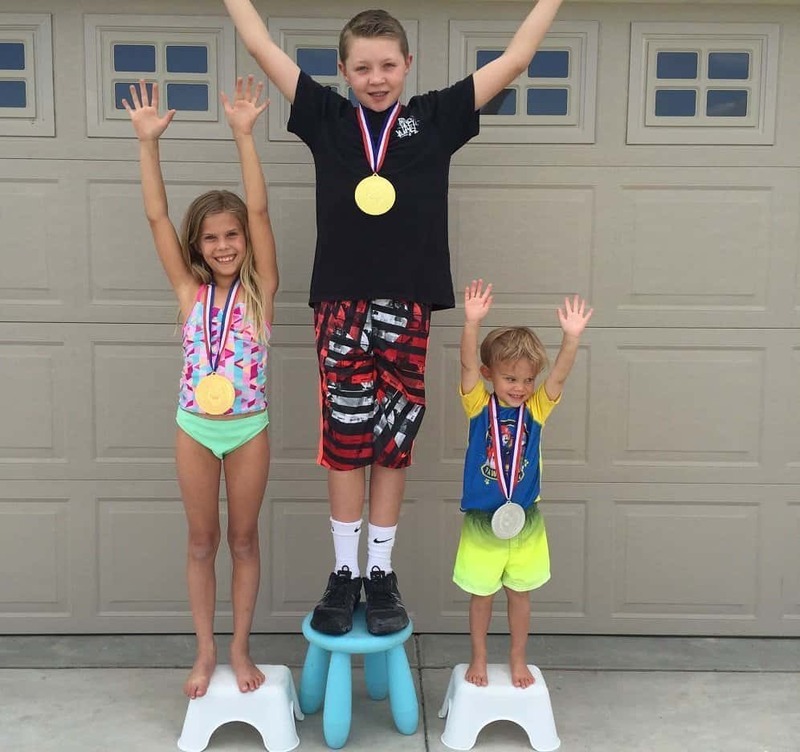 Our winner’s podium was three stools from IKEA. One taller in the middle and two matching stools on the ends. You can use anything from home or be super creative and make something. The kids loved standing on them with the big winners’ medals! Have all the little girls participate in a gymnastics competition. Our girls did a gymnastics floor routine, best hand stand, cartwheels, and best back bend. They were so cute. 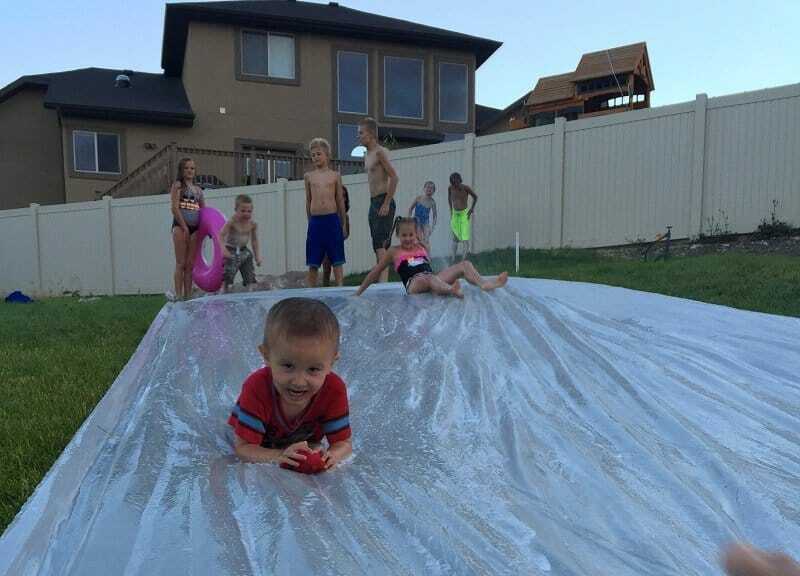 Host a slip ‘n slide competition. Our neighbors went to Home Depot and bought 100 feternal of plastic and stakes and made the coolest slip ‘n slide ever. The kids loved competing in this game. We did longest slide, fastest slide, and even shortest slide. I even went down a few times and it was tons of fun. Make sure to have a sprinkler going and break out the dish soap for some extra slide!! 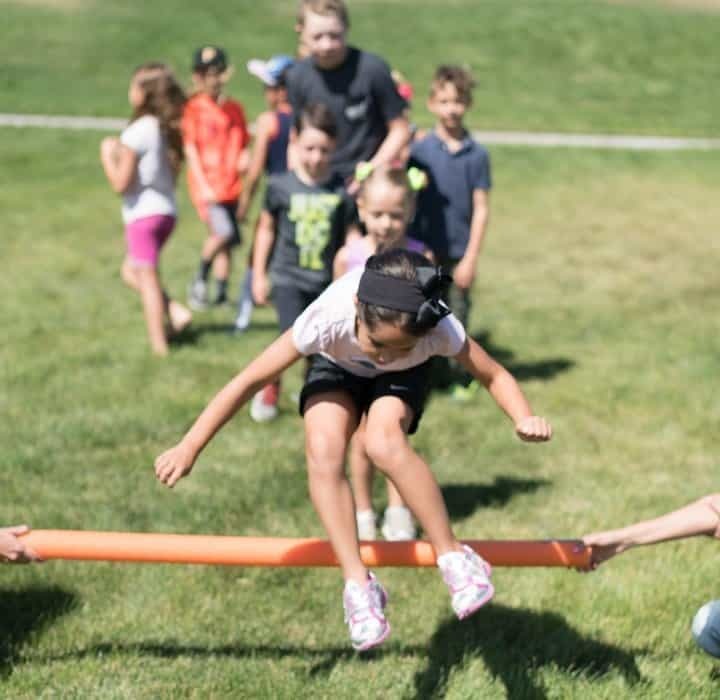 Create a fun relay race at a park. For a baton we used a trusty paper towel holder. 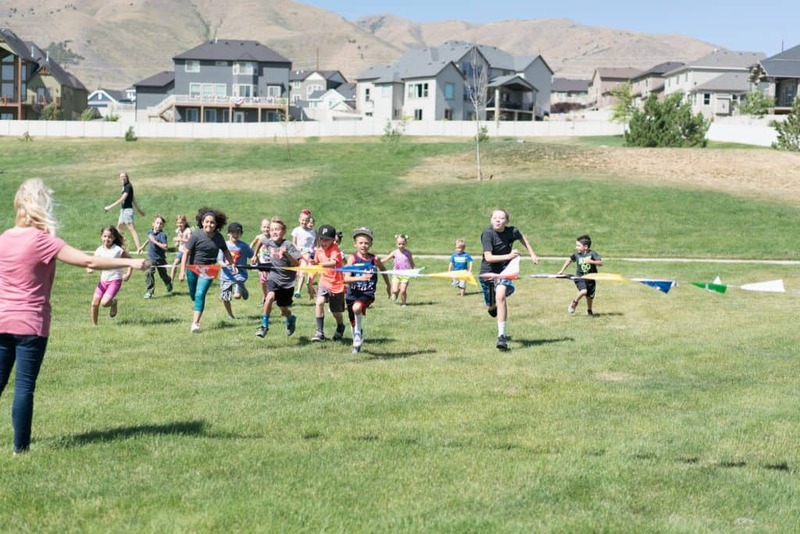 The kids loved running and racing the other relay teams. This one is a classic. You can purchase a banner from Zurchers and have the kids race to the banner while other moms hold it. Our kids were so excited to run full speed ahead. This is a great activity for little kids. Get a 2-liter bottle of soda and use the pool diving rings. Toss the rings around the bottle. Always a win. Another fun activity for little and big kids is to throw a basketball through a pool tube. We made it tricky and easy depending on the child. Keep the pool theme going and host a high jump. Have the kids jump over a pool noodle. We made it harder for the older kids. 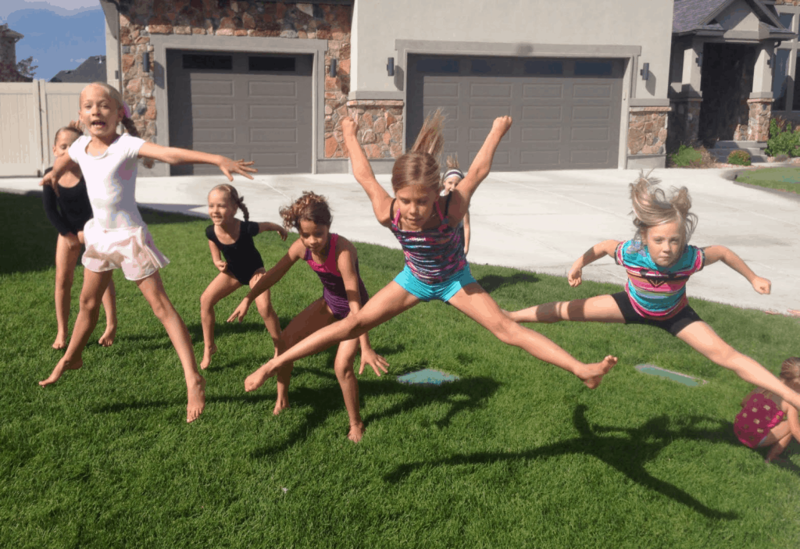 The little ones were so cute jumping over and they all had a blast. 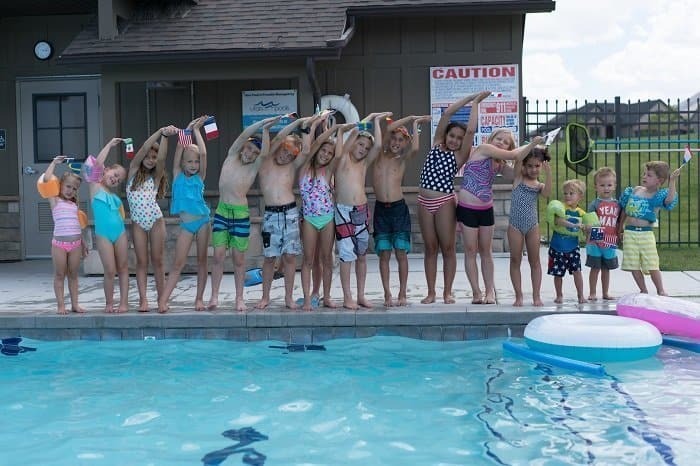 We went over to our community pool for the swimming portion of our games. What a great way to beat the heat for some fun competition. Of course you have to hold a cannon ball competition. The best splash wins! A kid favorite! 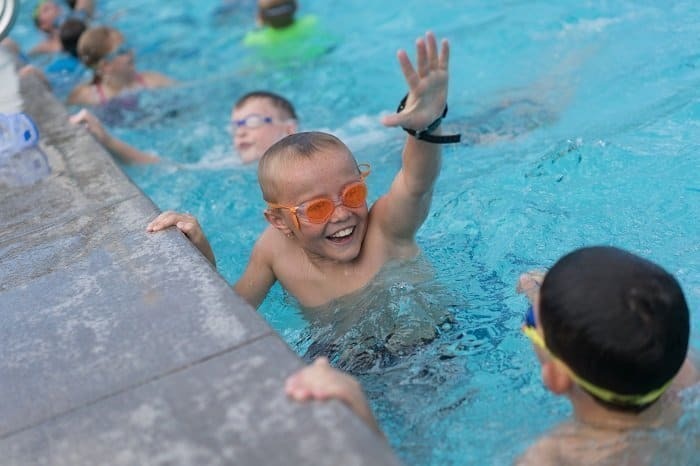 Other swimming games you could hold: fastest swim across the pool, who can hold their breath across the pool the longest, best belly flop, and the quickest back stroke. You could come up with so many pool events that are sure to be a hit. At the end of your events have a closing ceremony. The kids loved our closing ceremonies and everyone who participated got a medal to keep. If you are a super crafty mom there are so many fun things you could make and create. It could even be yarn with a yogurt lid. It can be as creative, crafty, or even as simple as you want. 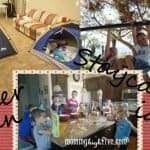 The kids are sure to have fun no matter what. They love being with their friends, competing and getting any little trinket to take home. We closed our games with donuts, cupcakes, and water. We then had a giant party and concert! We played Juicy Wiggle and other kid-friendly dance music and they danced the afternoon away. It was such a blast. 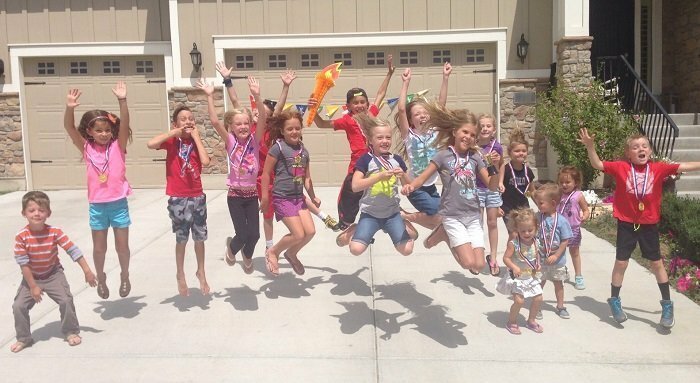 Your kids are sure to love being a part of their own Olympics. This will be an event they’ll be sure to remember. 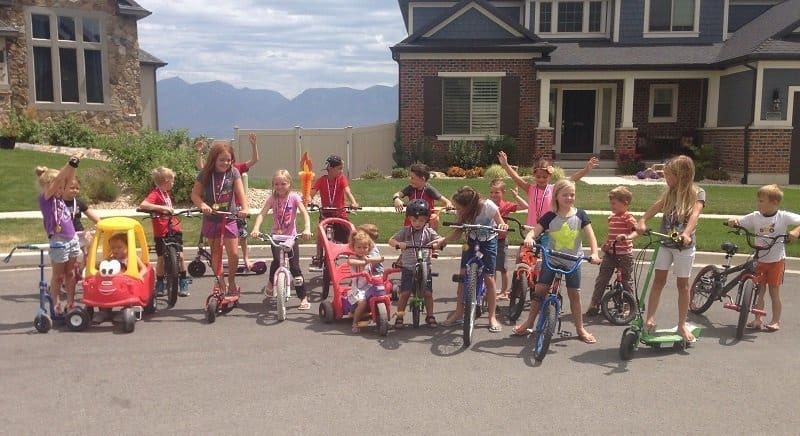 They will love having races, swimming, bike races, and parades. This will ignite in them the love for the Olympics and all it represents. For the few weeks that the Olympics are going on, the world isn’t concerned about politics or fighting with one another. It is the love of sports that unites us. It teaches us good competition and good sportsmanship. 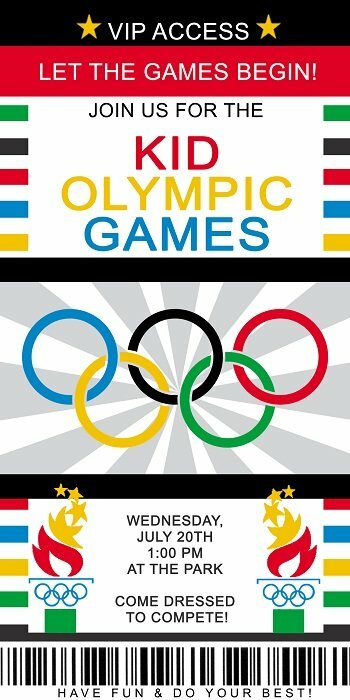 The Olympics teaches us about the hard work it takes to achieve the ultimate goal of a lifetime. It is about the love of our country, uniting together, rooting for our favorite athlete, and being proud to be an American. It may not be the real Olympics, but hosting this party has made my kids even more excited about watching the real thing. They’re so excited to cheer on our Olympians and be proud of our great country. I’m excited for you to host a Kid’s Olympic Games, too. Go Team USA!